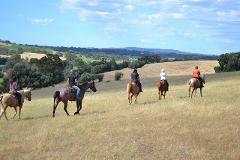 After your guide has matched you to your horse, we will assist you through the mounting process. Once seated in the saddle, we will share with you the knowledge to ask your horse to move off nice and quietly, steer and stop. This ride not only shares our vineyard with you but one of our favorite places to be, THE HILL! 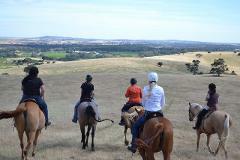 This magnificent place offers 360 degree views of the southern Barossa. Morning Tea with a View! Up and over the Hill - option 1 This ride not only shares our vineyard with you but one of our favorite places to be, THE HILL! Up and over the Hill - Option 2. This ride not only shares our vineyard with you but one of our favorite places to be, THE HILL! 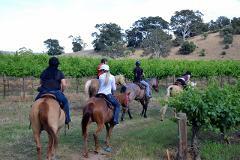 This magnificent place offers 360 degree views of the southern Barossa.